Please note: forest hours are dawn until dusk or dawn until 8:00pm, whichever is earlier. Take Hwy. 1 to exit 44 and follow signs for Maple Ridge/Mission via Hwy. 7b (Mary Hill Bypass). 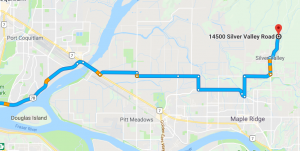 Follow Dewdney Trunk Road through Maple Ridge; turn left at 232nd Street. Turn right at Silver Valley Road, and continue until you reach MKRF at the end of Silver Valley Rd. Travel west on Lougheed Hwy #7 to Maple Ridge. Turn left off Lougheed Hwy onto 240th Street. Turn left on Dewdney Trunk Rd. Turn right on 232nd Street. Turn right at Silver Valley Road, and continue until you reach MKRF at the end of Silver Valley Rd. Take Sumas/Abbotsford Border Crossing. Travel along Hwy 9 north from Bellingham to Sumas border crossing. From the border crossing travel continue on Sumas Way to Abbotsford. At Abbotsford take the Abbotsford Mission (Hwy #11) following signs to Mission. Turn left onto the Lougheed Hwy (Hwy #7). Travel west on Lougheed Hwy #7 to Maple Ridge. Turn left off Lougheed Hwy onto 240th Street. Turn left on Dewdney Trunk Rd. Turn right on 232nd Street. Turn right at Silver Valley Road, and continue until you reach MKRF at the end of Silver Valley Rd.